Moderna villetta privata situata nello splendido parco della scuola d'arte C Barton McCann. Un concetto aperto con una camera da letto privata, ampie finestre e soffitti alti che ti permettono di goderti la natura in tutta comodità. Goditi il ​​tuo caffè mattutino o il vino della sera sulla grande veranda che si affaccia sul nostro lago privato Jeanette. Ascolta i picchi pileati al mattino e osserva l'airone pescare nelle acque. Guarda la luna che si alza dal molo del gazebo sul lago Jeanette e luccica sull'acqua. Laurel Run stream è a pochi metri dalla porta principale con trote autoctone e il laghetto può essere pescato e rilasciato pescato. Due ristoranti e una drogheria di campagna si trovano a 4 miglia se volete cenare fuori vicino o dimenticato qualsiasi articolo. State College e Penn State University sono a 15 miglia dal cottage e offrono una miriade di attività per l'atletica e la cultura. Whipple Dam e Greenwood Furnace State Parks sono raggiungibili in 20 minuti e offrono spiagge, picnic, pesca, kayak, canoa ed escursioni. Frequentemente utilizzato come un rifugio per la luna di miele dalle nostre coppie di nozze Fern Hill apprezzerete il romanticismo della proprietà. A soli 13 miglia dal centro di State College. Escursioni, gite in barca e altro a Stone Valley Recreation Area si trova a breve distanza. 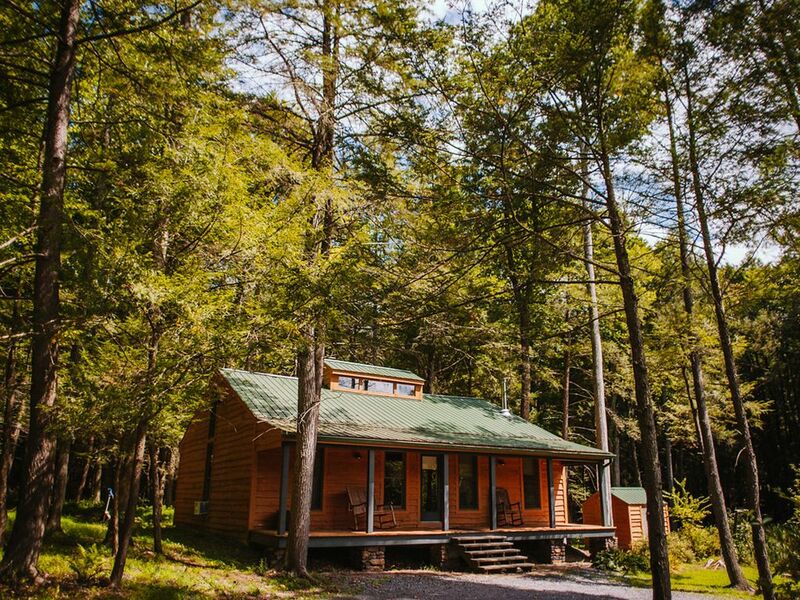 Entering the property thru the Rothrock State forest was like coming home to your own private retreat. The setting is tranquil and relaxing. The accommodations of Hemlock Cottage were outstanding! The cottage is warm and cozy with all updated appliances and everything needed for weekend, or longer, accommodations. Everything was immaculate, clean, fresh, and ready for us when we arrived. We stayed in the cottage for close and easy access to State College to attended a Penn State football game. However, this cottage would be great for romantic weekend and any type of celebration or retreat just to get away. Walking the fabulous grounds offered a great opportunity to get outside and enjoy the great weather and enjoy the artistic setting around the cottage. This setting also offers a high end gazebo on the pond in front of the cottage. Looks like it would accommodate weddings, parties, etc...We are already planning a return stay and would HIGHLY recommend this property. Thank you, thank you! For your kind words and your appreciation of our property. We would love to see you come back. Guests like you make us feel great! We thoroughly loved our stay. The property is absolutely amazing, very beautiful and peaceful. The grounds around the cabin with the trees, pond, and outdoor art draws you to sit on the porch for hours. The cabin is bright, clean, and very comfortable. We rented for the weekend as we were attending a Penn State game. The location is only a short 15 minute or so ride into downtown or the stadium. Sue provided clear instructions and was very responsive. We were very impressed and absolutely plan on visiting again! This was a lovely cottage in the most beautiful setting! If you are looking to get away and relax and be a little off the grid...this is the place to be! Though very private...its close to Pennstate campus and the town if you need anything! Sue was always near by to help if we needed anything! We went mid October and it was just beautiful it even snowed a little! It was our chance to recharge...even though just for a day! They provide everything you need except for food....you can even bring dvds to watch movies! So fun! Thank you so very much for your kind words and we are so happy you enjoyed it! We love to have guests like you experience and share our spaces. We hope to see you again. Gorgeous setting! Fantastic destination in which to relax and unwind! The grounds are beautiful if you are looking for peaceful, relaxing days, and yet there are also plenty of options for hiking, boating, and exploring with multiple state parks within a short driving distance. Would highly recommend! Thank you for your kind words. There is nothing we like more than to see others enjoy and appreciate our space as we do.